As I’m sure you’ve noticed, I am not a vegetarian. I love meat. But I also love moderation. I am perfectly happy going meat-free a couple times a week, and I’ve made it a normal part of my family’s routine. Going meat-free isn’t just good for our health, it’s good for our budgets and our planet. This recipe is my homage to Meatless Monday. 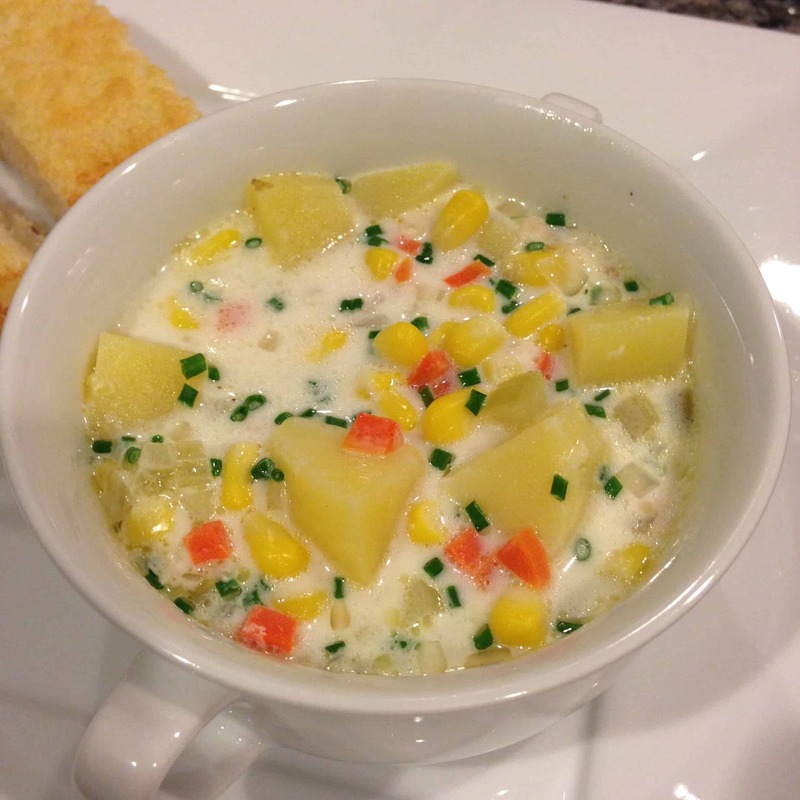 Give this Corn and Potato Chowder recipe a try and see how easy and delicious going meat-free can be! I started seeing “meatless Monday” popping up on various social media sites and I think I read about it in a few magazines, but I had no idea what a big deal it really is; it’s an actual movement. “Meatless Monday began in 2003, launched in association with the Johns Hopkins Bloomberg School of Public Health. In May, 2009, Ghent, Belgium, became the first non-U.S. city to go meatless. Shortly thereafter, Paul McCartney introduced the U.K. to Meat-Free Mondays.” Check out the website for more info, and make it a part of your weekly routine if you haven’t already. This soup is a great way to start. I modeled it after my grandma’s recipe, (She actually makes tuna chowder, which I love, and this is really that recipe minus the tuna). She usually makes it with evaporated milk, and you can absolutely substitute the half and half for evaporated milk–it is so old-fashioned; I love it. I just always have half and half for my coffee, so I throw it into recipes. It sounds funny, but the “secret” ingredient really is the celery. Celery seems so insignificant, but it makes all the difference in chowders. My French ancestors were really on to something with their mirepoix, and I’m happy to carry on the tradition. This is a great base for any kind of chowder. Try tuna, clam, chicken… and of course, feel free to start the recipe by crisping some bacon as long as it’s not meatless Monday. Finally, I am a big believer in dunking things in soup, so I serve it with something toasty, and usually cheesy… I can’t help myself. In a large pot melt the butter, and add diced onions, carrot, celery, garlic and bay leaf with a big pinch of salt–about a teaspoon, a few grinds of black pepper, and a teensy pinch of cayenne, if using. Sauté over medium heat until the onions are translucent. Add flour and stir to combine, cook for about a minute. Add wine and stock and bring to a boil, reduce heat to simmer and add potatoes. Cook for about twenty minutes until potatoes are just tender. Add corn and half and half, bring back to a very gentle simmer until heated through. Don’t boil! Taste and adjust seasoning. The salt you add will depend on your stock, so it is very hard for me to give an exact measurement. Just add what tastes good! Garnish with chives or parsley and enjoy! *One of the benefits of evaporated milk is that it can withstand boiling, so if you use it you don’t have to be quite as concerned about curdling as if you use half and half. 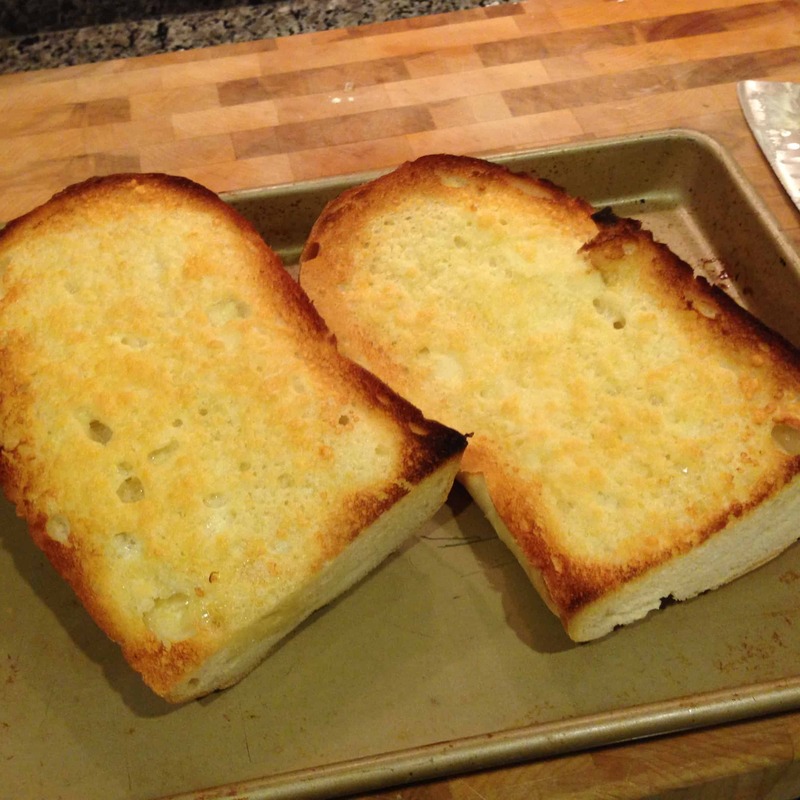 Smear bread evenly with butter, sprinkle evenly with cheese, place under broiler and watch carefully until the cheese gets brown. Don’t walk away! This happens fast! Slice and serve alongside the soup! You KNOW I’ll be trying this one soon!! Yes! You would LOVE it!! Come over and I’ll make it for you! Love you!